Well, they may be calling for snow next week, but that doesn't mean we can't start looking forward to spring time, right? And what's the best way to do that? 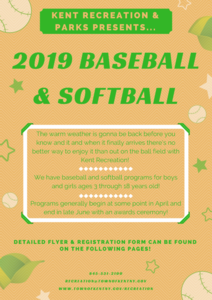 Why, by signing your child up for baseball or softball with Kent Recreation, of course! That's right, winter may be in full swing, but it's officially time to get your child registered for our spring baseball and softball program. We've got something for all children ages 3 and up so stop by the Kent Rec. office or CLICK HERE for more information and our registration form!